The mink frog is a medium size frog specie that grow from 4.5 to 7.5cm that is often called by it’s common name the North frog. Mink frogs name come from the odour they produces when catch or stressed, a smell of mink. Mink frogs are very aquatic frogs that requires a high levels of water and are rarely seen out of water when it’s not raining. 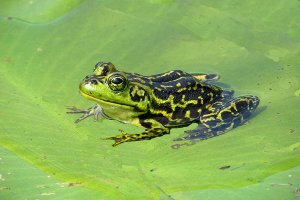 Mink frogs enjoy habitats with quiet waters and lots of plants like lily pads and pickerel weed. Their common name of north frog is really appropriate since it’s southern limit of distribution is at 43°N, the most northern limit of any North American frog or toad specie. Mink frog can be found in Canada in the Maritime provinces, Labrador, Quebec, Ontario and in the east of Manitoba. Mink Frogs are generally green to brown, with a yellow belly and are often dark spotted or mottled in a web pattern especially in male specimens that also display a pair of vocal sacs. These frog also display broad web toes. The green frog is very similar in appearance to mink frogs and both species show the same range of variation in colour. Mink frogs eat small invertebrates found mostly among aquatic plants and in open water. Beside of the breeding period mink frog is a quiet frog that is quite timid and are rarely seen out of the water. They also tend to be mostly active and seen at night time since they like to hide in the aquatic during the day to avoid hot temperature and predators. Mink frogs breeding season range between June and July and can be easily notices since male specimens calls day and night with a repeated “kut – kut-kut” call. Females mink frog lays their 400 to 5000 eggs attaching them to vegetation and rocks usually 2-3 meters deep into water. The tadpole stage lasts normally two years while tadpoles have an olive brown to green back with small dark spots and a yellow mottled underside with a paler tail. After their transformation into froglets, individuals reach their sexual maturity in another year or two..